As promised a week a go I'm here with a review on Maybelline's newest mascara, The Falsies Push Up Angel. I've mentioned this before in my Mascara Must Haves and today I want to show you why I love it so much! I'm a huge fan of Maybelline mascaras, I just think they do exactly what a mascara should do and I've never been let down by them. So of course I couldn't contain my excitement when Maybelline sent me their new The Falsies Push Up Angel. I had of course tried the original The Falsies Push Up Drama and loved it, so couldn't wait to give the newest addition a go! At first I was very surprised when I saw the wand, it was unlike anything I've ever seen before. The new Push Up Drama Angel has a plastic angel winged brush with very small plastic bristles. Now I'm a big supporter of Maybelline, especially their mascaras but I was concerned with how much these tiny little bristles could actually do! To my delight I was very wrong to question Maybelline, these little bristles are a force to be reckoned with. The angel winged brush has longer bristles on the edges to give your lashes that fluttering romantic look we all crave. Your lashes will be longer on the edges for an angelic alluring feel. As the name suggests, the brush instantly pushes up and coats your lashes for a bold black finish. At first I wasn't sure, but now I can't get enough. I love that this is so unlike any other mascara I've tried. Instead of the thick heavy bold long lashes, this gives romantic fluttering lashes. Sometimes you just need a change and the romantic angelic winged look, can make so many makeup looks, less dramatic and more glamorous and sophisticated. This is perfect for everyday for a fun flirty look and of course great for evenings for a glamorous feel. Of course I'm still a fan of thick long lashes, but this is perfect for a softer feel. Despite the size, the bristles grab on to every lash and lift and separate, they'll be no clumps in sight - just long gorgeous lashes. 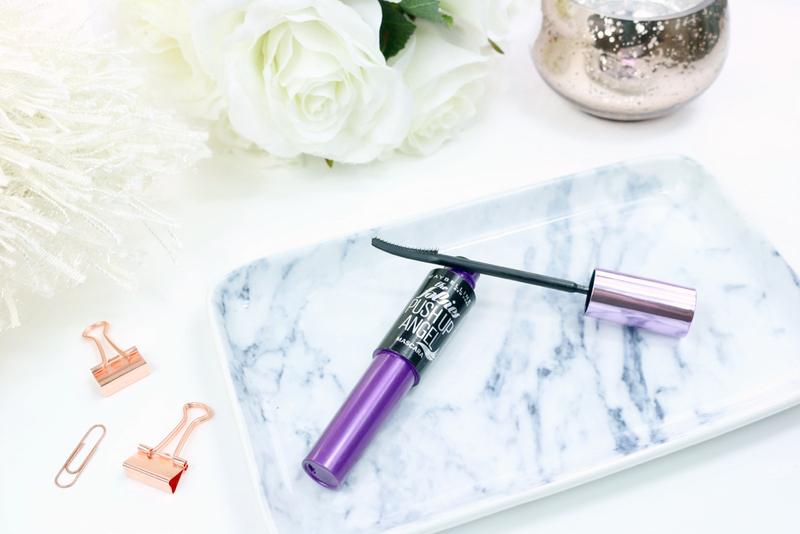 If you're ready to hang up your big bold dramatic lashes for a minute and give a more sophisticated and flirty look a go, The Falsies Push Up Angel is the way forward! I'd love to know your go to mascara right now beauties? If I like adding some length to my lashes, I believe thick lashes don't really suit my eyes, so naturally, the flirty and softer feel really speaks to me. I also agree about Maybelline Mascaras in general: there's no denying that they know how to do great mascaras! I will make sure to check this one out! This sounds like your perfect mascara! Me too! I think Maybelline has the best mascara products! This one will definitely belong to my next shopping list. I am one for the voluminous lashes, but I do see the appeal in going for a more romantic look. I guess I am just not a romantic person. But Maybelline mascaras are good, I can agree on that. The wand looks so interesting! I definitely want to try it out!